Teased by the beautiful weekend weather we have been enjoying in the Pacific Northwest, minds turn to gardens and hearts turn to hope for a season that will produce delicious tomatoes in our back yards. Though it may still be a little early here, we have put a few tomato plants in the ground and soon we will be looking eagerly for signs of the fruit we hope to enjoy by summer's end. The first sign will be one of these modest little yellow flowers. Small and almost fierce it is the early sign of effort paying off and garden dreams coming to fruition. I captured this image early last summer in a friend's garden. This small homely bloom made my friend's face brighten with hope and joy. Like a proud parent he seemed confident that this was the beginning of an eminently rewarding journey that would yield success and blessing. Last year wasn't the best year for tomatoes in this area. While I believe this small flower yielded an edible piece of fruit few gardeners felt they were truly successful by the end of the season. But, for most gardeners, hope springs eternal. 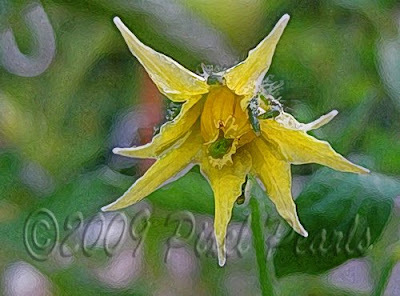 Tomato starts are flying off the shelves and into patio pots and backyards everywhere, and little blossoms much like this one will soon produce smiles and hope and joy for countless gentle garden enthusiasts. My goal for this image was to soften it to the color and shape of that hope. I contoured the image enhancing the intricate detail of the small blossom and softening the background to warm shades of summer color. In it I see the outline of potential, the shape of tenacity and the framework of fruit to come. I have to thank you for the reminder to get my tomatoes planted! Thanks also for sharing this beautiful image. I like the way that you have transformed a tiny yellow blossom into a symbol of hope!